is now on the platform of or choice; SQL Server 2017 on several Linux distros, that can run on Docker containers, and SQL VM in Azure, along with the good ol’ SQL Server on Windows. Let’s uncover the mystery behind the faster development and deployment of SQL Server. The file size of the SQL Server executable, sqlservr.exe, is ~3 MB in SQL Server 2017, compared to ~64 MB in SQL Server 2008 R2. The SQL Server team realized the importance of decoupling and modularizing the surface area code into much smaller components. The entire architecture is broken down into multiple smaller micro-services so that the deployments and integration are made on each of the respective components, and that the process is seamless. Starting with SQL Server 2017, Microsoft is no longer using the old model of release under which cumulative updates (CUs) were released every two months and service packs (SPs) containing all the fixes from the preceding CUs were released once a year. This new model allowed shortening the release cycle and features getting added to SQL Database and SQL Server faster than ever before. Most recently, the SQL Server engineering team managed to ship SQL Server 2017 along with the new cross-platform support within 15 months after the release of SQL Server 2016. This is in contrast with the legacy three-to-five-year shipping cycles of the past. One would feel why SQL Server2016 and 2017 are such big releases in a matter of a difference of just a few months. However, starting with 2017, Microsoft is moving to a rapid-release cadence with enhanced functionality and new features being rolled out annually instead of having to wait two or three years between versions. Clearly, two of the biggest changes with SQL Server 2017 are its support for Linux and Docker containers, both of which could have a big impact on the database trends of the future. The release of SQL Server 2017 for Linux has proven to be a step towards extending the capabilities to a high-performance platform, which has already set some TPC benchmark records. In this release, we can look forward to running SQL Server instances on Linux computers. 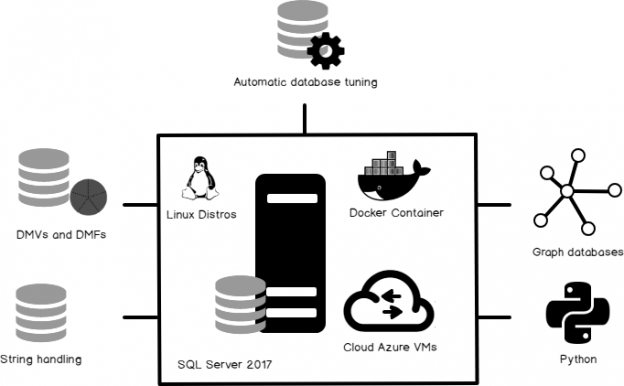 Many of our previous articles show you how to get started by creating a RedHat virtual machine in Microsoft Azure, as well as installing SQL Server on a CentOS machine. Here are some of the articles. Python and Powershell is two sides of the coin, according to this article: Why would a SQL Server DBA be interested in Python? This section explores the integration of Graph database components in SQL Server 2017. The pointer at the end of this section includes a working data set of relational and graph databases, and data models. In addition, it explains how to integrate graph databases with relational databases and how to convert the relational tuples into a graph data set. A key concept of graph databases are edges and nodes. The relationships allow entities to be linked together directly, and in many cases retrieved with one operation. In some cases, due to stringent data modeling design, the relational data model may not be a good fit as it incurs costly join operations. In the past, the lack of viable alternatives and the lack of support made the graph model a difficult alternative, but that is no more the case. We’ll also look at the integration of graph database support to help model many-to-many relationships as nodes and edges, rather than with the traditional relational model. The footprint of the graph database technology in the IT industry is clearly visible today, and for good reasons such as adding efficiency to social recommendations, IT network analysis, fraud detection, product recommendation, and so on. One of the major capabilities of modern computers is processing the human language. Basically, the strings are transformed into the code which is then processed by a machine. The built-in string functions have always been efficient in handling string literals. It is possible to find and alter string values using various options. However, string functions and string manipulation consume most of the query execution time in decoding the various parts of the character literals. SQL Server 2017 offers various new string manipulation functions, which have been in the talk for many of its features that simplify a developer’s life; no more writing long T-SQL statements with temporary tables and complex logic, only to manipulate and aggregate strings. With the advent of system objects, the metadata of various pieces of SQL Server have been exposed for a better understanding of the entire system. These system objects, for the most part, are a cumulative collection of data, or the aggregation or accumulation of the various counter values or different data-structures of SQL Server. Most importantly, the data is real time, and obviously dynamic in nature. In most of the cases, the DMVs are used, and they define the baseline or pressure points of various metrics that determine the performance of the system. The DMFs provide cumulative statistics of the requested parameters. A new column modified_extent_page_count introduced in sys.dm_db_file_space_usage to track differential changes in each database file of the database. Read the Top 8 new (or enhanced) SQL Server 2017 DMVs and DMFs for DBAs to find out more. Resume: Resume an index-rebuild operation, after a failure. Pause: Pause the rebuild operation (and resume it at a later point). Rebuild: Rebuild large indexes with minimal log space usage. I feel that SQL Server on Linux, Python Integration, Graph Databases and Resumable index operations stand out to be the top features of SQL Server 2017. The list of many features and enhancement does not stop here. I will discuss the other pieces we omitted, in a separate article. What are your top features in SQL Server 2017? Feel free to comment here!